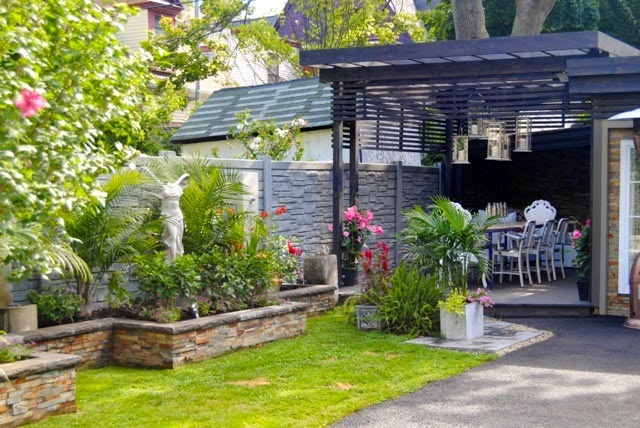 Like the classic mullet haircut, this garden is formal business in front and all party in the back! 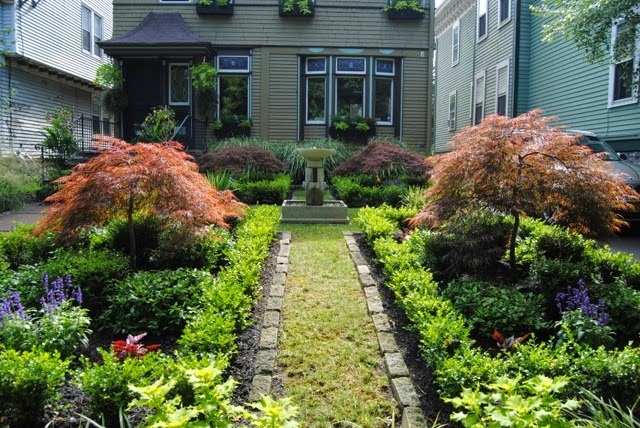 Shown above is the front yard garden and it could not be more formal with its four symmetric parterres of Japanese maples, perennials and boxwoods, all surrounding a great water fountain. The garden is on Norwood Avenue, down near the Summer end, for those that know the neighborhood. 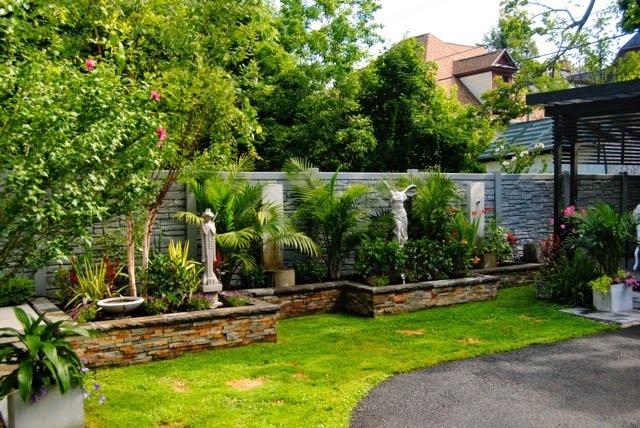 Even though its underlying structure is formal, the plantings are looser and more casual, making a strict formal garden feel a little more "Buffalo-like." That may not be true once those outlining boxwoods grow in more together and get trimmed. Trimmed boxwoods instantly give a garden a crisper look. 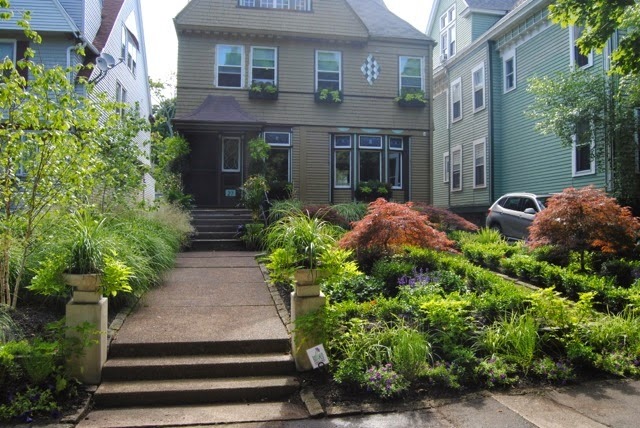 We like our grassless front yards here in Buffalo, and most fall into the "Cottage-y" category, if they can be classified at all – jam-packed with little regard to spacing and color coordination. The side "yard" along the driveway was even more of a revelation. 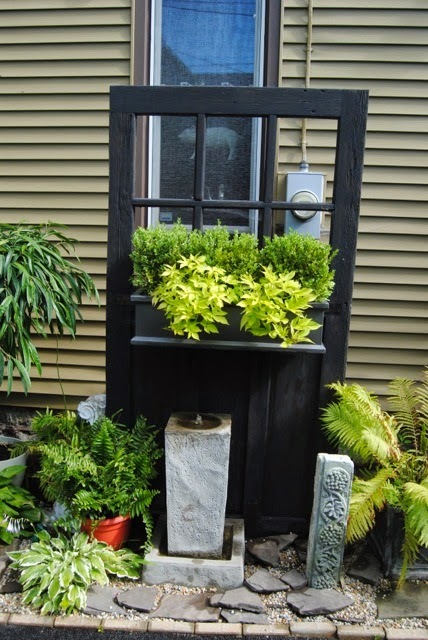 These sculptural black doors with planters and stone fountains make you stop in your tracks. 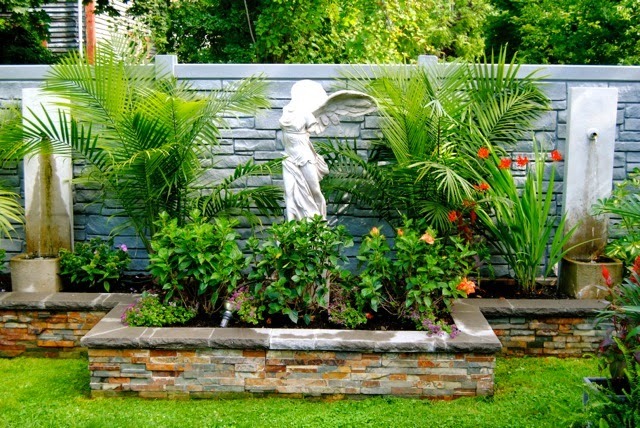 The gardeners here are the owners of room buffalo, a contemporary furniture and interior design firm here in Buffalo. 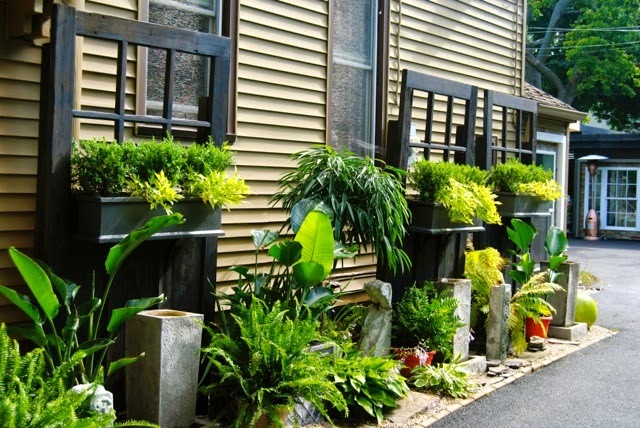 They also own the high-end garden store, sprout. Their store has great window displays and merchandising of the furniture they sell, as well as showing off their interior design skills. In this side garden they've really shown their merchandising skills. 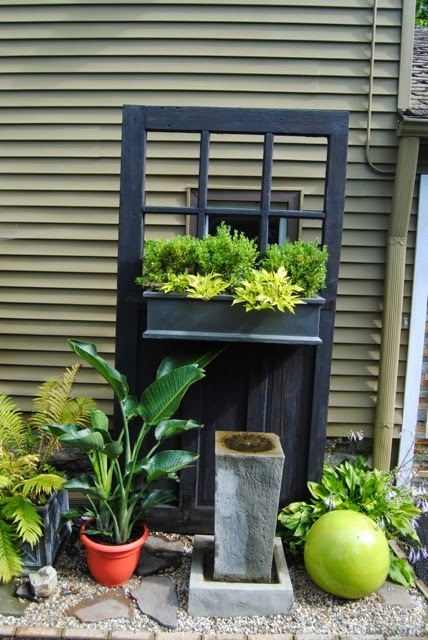 This looks like a display you'd more likely find in a very upscale garden nursery or the the Philadelphia Flower Show. Each doorway was not a mirror of the other, but slightly different and asymmetric in arrangement – using planters, balls, carved stones, and more. 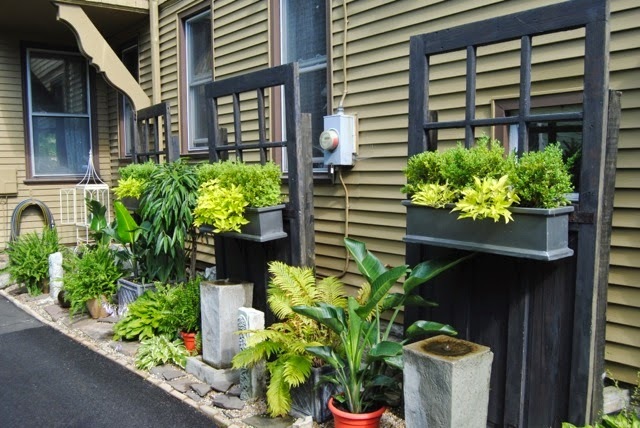 Using a palette of only black and gray, a pop of red-orange – and greens of the plants (no flowers for color), it made a handsome area from what could have been a bland space in which many would not even consider gardening. And then there was the back yard. 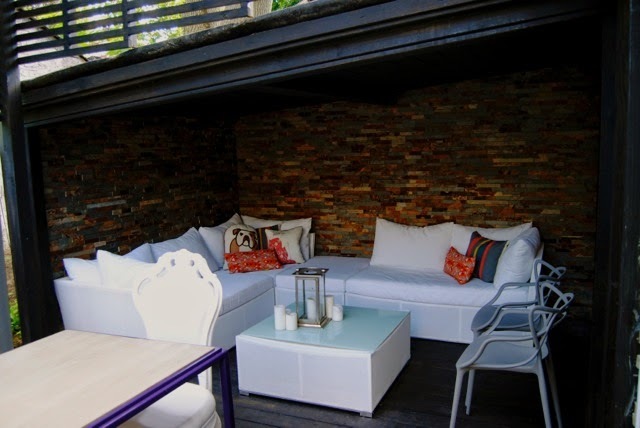 About one-third of the garage is given up to a (slightly) raised deck covered dining area with a sectional outdoor sofa sitting area and side enclosed sitting room. You can see from the photos this is no picnic table and folding chairs party space. The sitting room is off to the side of the dining room and is accessed by sliding doors. The long wooden table is lined with metal chairs and two ornate outdoor Victorian Captain's chairs. 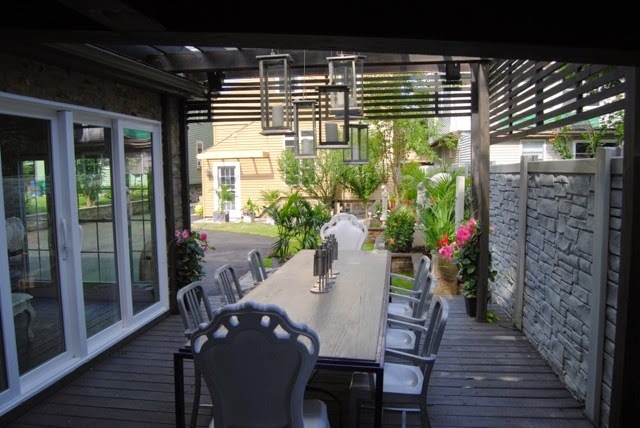 Arbor-like beams and horizontal metal louvers above shield strong sunlight – a hung arrangement of candle lanterns make for a chandelier for when that strong sun disappears. 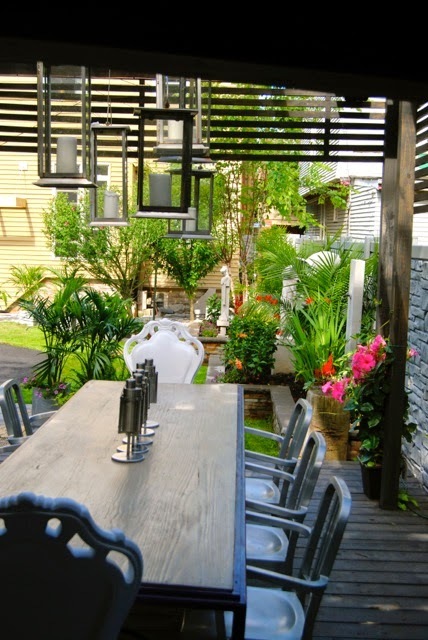 A fence of stone-looking material unites the dining area with the rest of the outdoor garden. 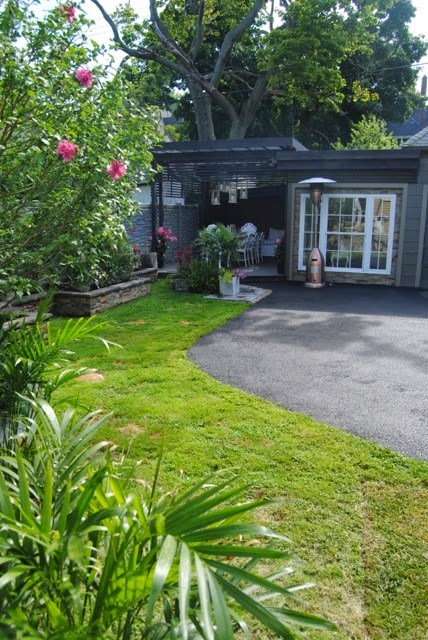 The rest of the garden is made of raised beds of again, mostly leafy plantings ( not much flower color), set on the minimal grass yard. 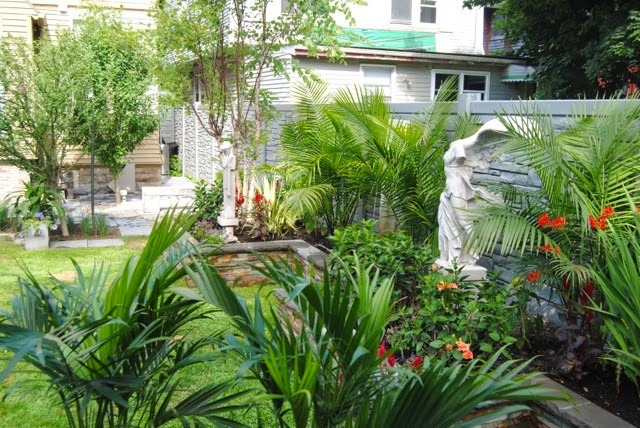 Two sculptures, well-known to Buffalonians, take thier place in the largest two beds. The Nike (Winged Victory of Samothrace) statue, on the right in this photo, is a small-scale production of the actual size reproduction in Frank lloyd Wright's Martin House Complex here in Buffalo. The other on the left is a reproduction of Frank Lloyd Wright's Midway Gardens Sprite. The Sprite is not associated with any Wright-designed buildings in Buffalo, but Buffalo has an affinity for anything Wright, and most would recognize it. 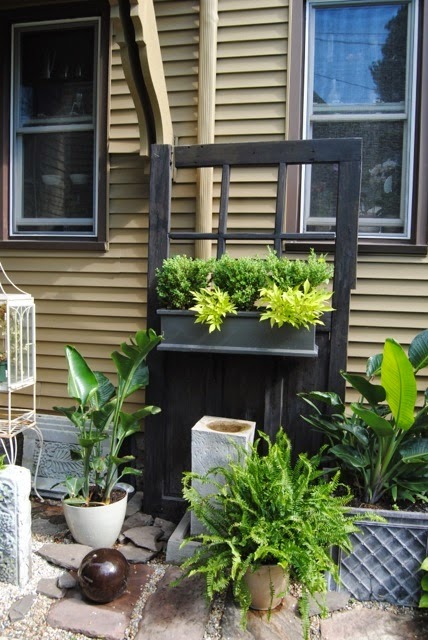 It's also sold in this garden's owner's garden store sprout, on Hertel Avenue. Just so you don't think all that is enough, there's an extra sitting area (in case you get tired of walking back and forth from house to party house). 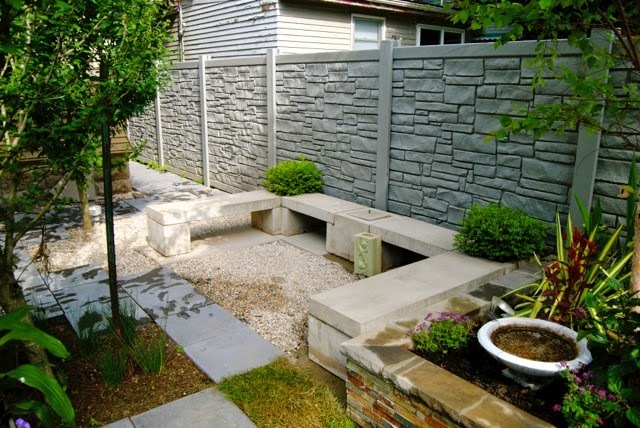 This stone block sitting area looks more like a sitting area in a museum's sculpture garden than a side yard in Buffalo. Every year there's always a garden or two on the Walk I've never gotten to that blows me away in it's creativity, quality, design, and execution. This year, this was the garden. a tad privacy, but help make the entire space feel more enclosed and room-like. The alcove behind the dining table. Pre-dinner drinks for sure. The backyard raised bed gardens apparently are designed to be viewed from the dining table. Enclosed seating area to the left. For when the weather gets inclement, or you decide to get intimate! I really love how these individual still-life-with-plants areas stand so strongly on their own. 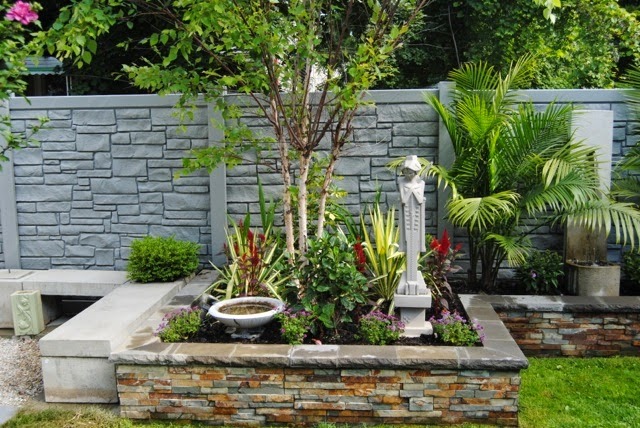 This raised-bed garden is punctuated with matching stone fountains. So many good ideas in this beautiful garden. 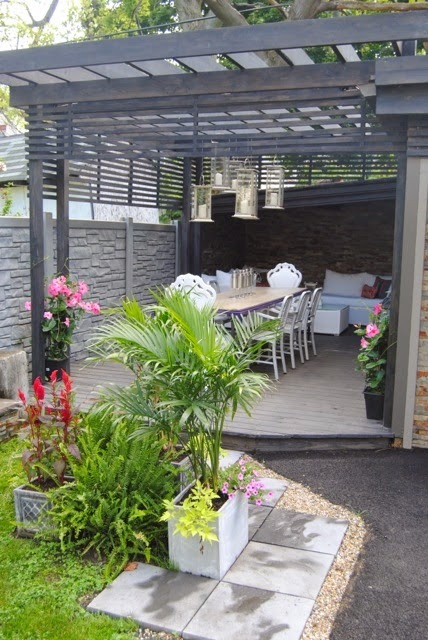 As we consider moving and building a new garden I'm collecting ideas. I wish I could tear this out and put it in a folder. It'll always be here for you Pat. Good luck in moving! I'm sure it's hard to give up a garden - but a new challenge awaits!